Equipped with sharp blades, the Panasonic ES2291D503 Trimmer delivers a close yet comfortable shave. Its floating head follows the natural contours of your face and leaves your skin feeling smooth and flawless. This battery-powered trimmer is easy to maintain and operate. 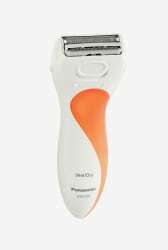 Its hypoallergenic blades are suitable for sensitive skin. Featuring a cordless design, this compact trimmer is portable.